Second Destiny: Nooooo..... don't go! When I heard that Evie's closet was retiring three gorgeous designs, I rushed myself over there to add these incredible treasures to my closet. 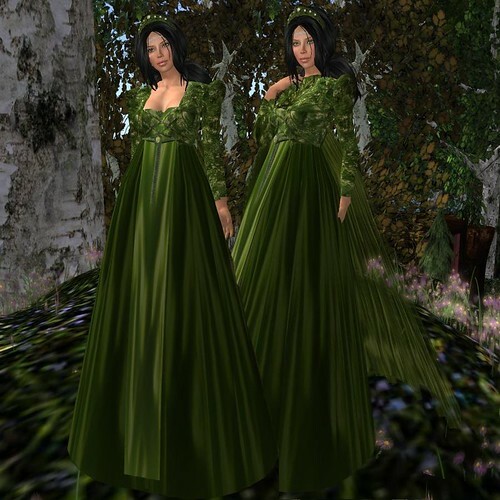 The three gowns (4 if you count the two colors of the Devotion Gown) are Apricot Sorbet Faerie, Chrysalis, and Devotion in Ivy and Plum are all set out for only 100L and after this sale, sadly, they will no longer be available. "There now... you're safe with me my lovies," she says consolingly as she hugs the silken gowns to her chest. Evie's Gowns are the kind of quality that even her old "retiring" designs are leagues ahead of the competition in both design and incredible texturing. It is a shame they are going away for good. So if you would like to enchant your wardrobe with the rare kind of magic found only at the hands of Evangeline Miles, please visit Evie's Closet today, before it's too late. While at Evie's my eye was caught by another gown that is not retiring but is on sale for only 500L as a set of two skirt options. The Aventine Angel is glowing white goodness that is either magically enchanted or has some kind of spell on it because when I put it on, I found myself immediately transported to another time, as the princess of my domain, with a royal court clamoring over themselves to woo me. It's true, but don't take my word for it. Buy the Aventine Angel and try it out for yourselves, but be ready for lots of IM's! The Dusk wings are by Wishbox and not included with the Aventine.